In 2007, contemporary artist Halil Altındere and writer Süreyyya Evren published"User's Manual: Contemporary Art in Turkey 1986-2006," a book that examined the development of contemporary art practices in Turkey from 1986 to 2006. The book brought together texts by Turkey's leading art writers as well as selected works of artists. Comprising of the story of contemporary art in Turkey in two decades, it featured 78 artists from four generations. Now, almost a decade later, Altındere and Evren are back with "User's Manual 2.0," a new version of their project. "The volume you are holding has become something more than an expanded second edition of 'User's Manual: Contemporary Art in Turkey 1986-2006,' published in 2007," they write in the preface. "Therefore it was necessary to underline that this was a new book, and a new level, and we revised the title as 'User's Manual 2.0.' Not a new edition, but a new version." Designed by one of Turkey's most subtle and inspiring artists, Şener Özmen, the book is published as a cooperation between the Berlin-based Revolver Publishing and Turkey's art-ist. The first thing one notices about the book is its design, which is striking. 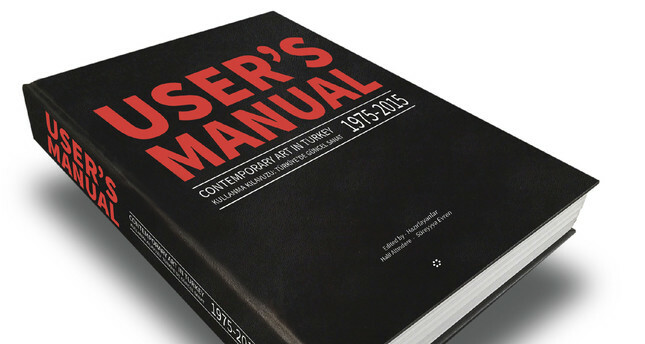 Some 664 pages long, "User's Manual 2.0" is a door stopper. With its black hard cover, considerable weight and ambitious design, it is a work of contemporary art itself. In this edition the editors have included texts by Nilgün Özayten, Ali Akay, Ahu Antmen, Marcus Graf, Beral Madra, Vasıf Kortun, Fulya Erdemci, Rene Block, Charles Esche, Hou Hanru, Carolyn Christov-Bakargiev, Derya Yücel, November Paynter and Osman Erden. Those texts appear in the first half of the book. From Istanbul Biennial curators to art writers and historians, those authors form an impressive group. Their essays focus on subjects like Turkey's art institutions, the ideology of Istanbul Biennial, youth action exhibitions in 1990s and how Turkish art constructs gender from 1970s to the 2000s. There are interviews with Christov-Bakargiev, the curator of the current Istanbul Biennial, as well as talks with Charles Esche, Rene Block and Hou Hanru on the various transformations of Turkey's contemporary art scene. The book opens with Süreyyya Evren's introductory essay, "How to write the history of contemporary art in Turkey," where the writer explores a history "shaped by leaps and laden with disjointed actors as well as moments" through the lens of historiography. "Reflecting back on the '70s and '80s we cannot really speak of an art scene in Turkey but of single artists, artworks, exhibitions and group exhibits," Evren writes. These were periods when a great many avant-garde works of considerable authenticity and refinement were produced and one can even note a blending of collaboration and group work with activism and avant-gardism." This era was preceded by the 1960s, which saw a large number of artists in Turkey, including Komet, Füsun Onur, Mehmet Güleryüz and Cengiz Çekil, travel abroad to study in France and the U.S. on grants or state scholarships. "Biennial attendances and individual outbursts aside, one has to admit that the Academy was very influential in Turkey's art scene up until the 1980s," Evren observes. With this new decade where a rapid swift liberalization of Turkey's economy was followed by the emergence of free trade, a new ethos started defining the art scene, putting an end to the monopoly of the once all-strong Academy. "The free market shaped by the neo-liberal policies of the [Turgut] Özal era has a significant impact on the field of art," Evren explains. "Under the influence of the free market, power passes to the hands of gallery owners and art dealers. As the bourgeoisie forged by the era puts more emphasis on collecting, an influential art market comes into existence, albeit of relatively local scale." The first editions of the Istanbul Biennial, curated by Beral Madra,Vasıf Kortun and Rene Block, brought about "the first transformation in the exhibition form, based on national representation." This was followed by the curatorial decision of no longer feeling obliged to feature biennial artists predominantly from Turkey and a gradual internalization of the art scene. Rosa Martinez, another crucial figure of this era, "brought about the introduction of Kutluğ Ataman -who was actively producing in the field of cinema- and Halil Altındere -still a student at the Marmara University then- to the art circles in Turkey and the world." The politically daring stances of these artists brought about challenges to the established art discourses in the country. "The most significant change in the art scene from the mid-2000s on was the opening of many new galleries that worked with young artists and operated exclusively in the field of contemporary art," Altındere writes in his essay for the book. "These galleries stood out in that young gallerists were mostly their founders, and they began to represent young artists." From Galerist, founded in 2001 by Murat Pilevneli, to Rodeo, Outlet, NON Art Sümer, Alan İstanbul, Elipsis, Mana, Sanatorium, Pi Artworks and Pilot all based in Tophane and Karaköy neighborhoods, to Rampa in Beşiktaş and X-ist, Dirimart, Merkür and Çağla Cabaoğlu in Nişantaşı, these new galleries created a new audience for contemporary art, further transforming the art world once dominated by the Academy and the statist ideology. The second half of the book features works from artists most of whom had rose to prominence in those years. With artists including Ayşe Erkmen (1949), Cevdet Erek (1974), Deniz Gül (1982), Gülsün Karamustafa (1946) and İz Öztat (1981), the selection here features a wide range of contemporary artists; no gender, ethnicity or political stance seems dominant in the choices made by Evren and Altındere. With many of the artists living abroad (İsmail Saray in London, Sarkis in Paris, Aykan Safoğlu in Berlin and Amsterdam, Meriç Algün Rinborg in Stockholm) and others opening shows in different cities in Turkey and Europe, the globalized state of Turkey's contemporary art scene finds its echoes in this meticulously researched, and beautifully executed book.